This hand truck trolley was originally designed for Hotpoint and is used in the warehouse to carry two washing machines or two fridges. The capacity of the Alan Stuart Engineering Ltd Hand Truck is 250Kgs and considering the weight of it is only 17 Kgs this proves to be a useful work tool in the warehouse. 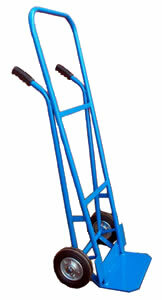 The Hand Truck Trolley has a Toe Plate width of 343mm and come with 8 inch wheels as standard. All Alan Stuart Hand Trolleys and Hand Trucks are of a very robust construction and can last years under heavy load. For more information on Hand Trolleys, Hand Trucks and Handling Equipment, please contact us. Alan Stuart Engineering Ltd is based in Salford, Manchester and we create bespoke hand trolleys and trucks for the removal industry. Industrial hand trolleys, Industrial hand trucks, Industrial folding toe sack trucks, Industrial folding toe sack trolleys, Industrial handling equipment, Industrial hand operated trolleys, Industrial hand operated hand trucks, Industrial strength removal trolleys, Industrial strength removal trucks, Industrial Flat Bed Trolley Trucks, Industrial Carpet trolleys, Aluminium Piano Trolleys and Piano Trucks, Heavy Duty Trolleys, Heavy Duty Trucks, heavy Duty barrel trolley trucks, Brewery trolleys and brewery trucks, Barrel skids & skid hooks, Industrial delivery trucks, heavy duty stair climber trolleys, stair climbing hand trucks, heavy duty sack trolleys and light weight sack trucks, drum trolleys and drum trucks, factory floor barriers, security caged hand trolley trucks and industrial check in counters.